Earlier this month, we announced the Radar Segment Source beta. Segment customers can now send Radar Geofences, Insights, and Places events to hundreds of destinations like Amplitude, Redshift, and Slack. To show how simple it is to use Radar + Segment, we built an app that posts to Slack when employees enter or exit the office. And we did it all in less than an hour. Radar abstracts away the challenges and cross-platform differences of location context and tracking, allowing you to add location context and tracking to your app with just a few lines of code. 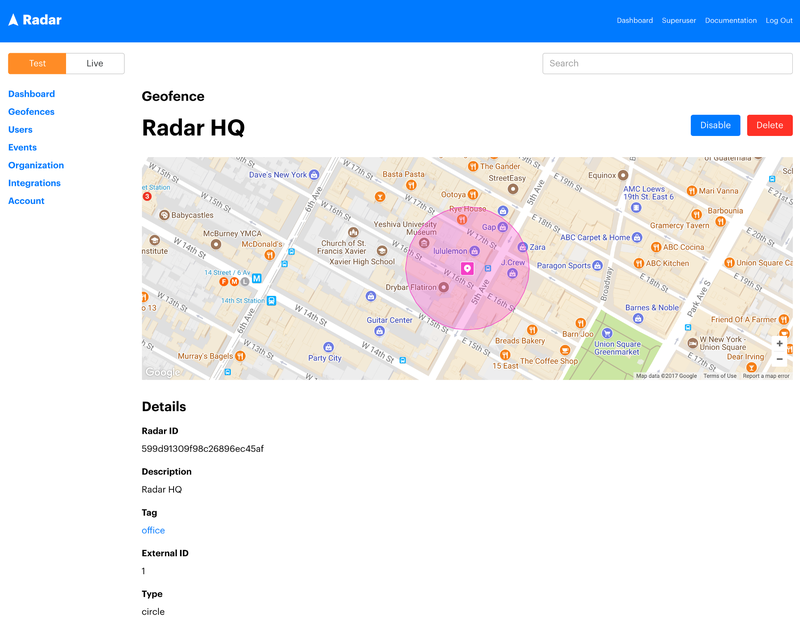 Radar has three context types: Geofences, Insights, and Places. In this case, because we know the location of our office, we'll use Geofences instead of Insights. You can create Radar geofences via the dashboard, CSV import, or the API. In this case, we create a geofence via the dashboard. On the New Geofences page, we search for a place or address, then customize the metadata and geometry of the geofence. After signing up for Radar, this takes less than a minute. We can integrate the Radar SDK into an iOS or Android app with just a few lines of code. That's it! Starting from an existing app, this takes only a few minutes. We're done. By copying and pasting an API key, all of our Radar events are sent to Segment. With the Radar Segment Source beta, Segment customers can send Radar events not only to Slack, but also to hundreds of other destinations. If you're a Segment customer and you want to integrate Radar, contact us! We'd love to help you get started.